I'm so excited to see Davenport grow as a player. We saw flashes the last couple of weeks, but he really balled out tonight. He had 2 sacks (one of them was a strip sack) and played great against the run. He's still incredibly raw, but it's great to see him still being able to contribute. Just wanted to pop over from Browns nation to offer our congratulations to Drew and the Saints. What a tremendous career accomplishment. And I cannot think of a better scenario for this to have happened. Drew Brees is New Orleans and New Orleans is Drew Brees. Breaking such a once thought unattainable record at home was awesome for the fans to have shared this with their leader. Whenever Drew does finally decide he no longer wants to play, I'll start the clock for five years hence - and we will see all of you and Drew down the road in Canton, Ohio. What a tremendous career accomplishment. And I cannot think of a better scenario for this to have happened. 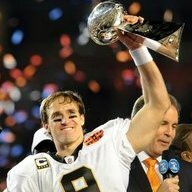 Drew Brees is New Orleans and New Orleans is Drew Brees. Breaking such a once though unattainable record at home was awesome for the fans to have shared this with their leader. Your comment is appreciated. And for what it's worth, I am rooting for the Brown right now man. You guys deserve a winner, Browns have some of the most passionate fans and a team that hasn't deserved them in some time. I like Baker a lot and really hope he continues to develop into the real deal that he has shown he can be. Good luck fellas. I have an opinion. And what its worth is up for debate. But hear me out. I acknowledge that Ingram being back has an impact on the offense. This cannot be denied. BUT...in the previous games, it has seemed like the Thomas and Kamara show as far as passing is concerned. Ginn is out 1 game and look at the offensive explosion. Suddenly Meredith and Quan making themselves heard, more balls going to the TEs. Look I like Ginn, he has come in as a stop gap Devry Henderson and has played pretty well in the role. But Quan looks more than able to supplant him. Like right now. Kid has the moves and the speed. Not to mention the hands. And Meredith looks as healthy as can be. He is fitting very well into the offense. Am I the only one who feels like 1/2/3 should be Thomas/Meredith/Quan at this point (with 2 and 3 interchangeable)? For what it's worth, If we can't win another Super Bowl, there's no team I'd rather see win it than the Browns. Thanks to Saints Nation for the good wishes and Baker comments. We all have our allegiances to our own teams, but in the end - we are all football fans, and that is what ties us together. I agree on Mayfield. I hate the Sooners with a passion, but man every time I watched that guy play in college I couldn't help but think he was going to be a really good one at the next level. Was really hoping his "off the field" stuff, and lack of height would have made him slip a bit in the draft as I really wanted him to fall to the Saints. I agree that Smith/Meredith appear to be ready to take more snaps, but I do think Ginn still has a spot on this team. As all around WR's Smith/Meredith likely bring more to this team, but Ginn still has the speed to take the top off of a defense. Having a guy like him just adds to the weapons at Drew Brees's disposal as he brings a different element than guys like Thomas/Smith/Meredith. As you mentioned it also helps having Ingram back. We really do have a crazy amount of weapons on this offense that can beat teams in so many different ways. I should have clarified, I am not stating I think we should dump Ginn. I agree, he still has a role he can play. But I think it's time for his snap count to decrease in favor or Quan and Meredith. Yeah I definitely can get behind that. It's probably has to do with trust issues between Brees and the non-Thomas/Ginn receivers. Brees will throw to the guys he trusts will make the play at the time and he trusts Thomas and Ginn to do that. With Ginn out it meant that more plays will be heading to other WRs by necessity.